Around the world, UNESCO World Heritage Sties are very well known. Just by making this list, a destination would instantly become a top travel destination. In Japan, there is a ranking system that is somewhat similar to the UNESCO World Heritage Sites but is unique to Japan. It ranks the “Top Threes” of Japan for several different categories, including one of which I will introduce to you today. It is called the Three Finest Views in English on “Sankei” in Japanese. The “Three Finest Views” refers to the beauty of the scenery and the overall awe-inspiring impact of the location itself. The perhaps most well known of these three views is Miyajima. Miyajima is a small island about a 10 minute ferry ride away from the port at Hiroshima. In traditional times, this island was known as the Island of the Gods, and humans were not allowed to live on the island. Because of this, there is a famous red “torii” (gate) near the shore of Miyajima. This torii is meant to separate the secular and divine worlds in Japanese religious belief. Torii are often found outside many shrines, not only at Miyajima. However, what makes Miyajima truly spectacular is that as it is located on the shore, you can see it both at high tide and low tide. While this may seem insignificant, if you happen to see if it high tide, you will be taken aback by the beauty of the torii that looks as if its just floating upon the water. It is honestly a once in a lifetime type of view that will remain with you even long after you have left Japan. If you want to make sure that you can see the torii at high tide, you can look up the high tide schedule in advance and plan your day accordingly. Although, depending on your preference, seeing the torii during low tide may well be worth your while too. At low tide you will be able to approach the torii and even touch it if you so like. By literally standing next to one of the holiest sites in Japan you may even feel spiritually rejuvenated. The high tide torii is the traditional breathtaking view, but the low tide torii definitely gives it a run for its money! Many tourists to Hiroshima simply view Miyajima as an easy and convenient side trip after visiting the Atomic Bomb Dome and museum. However, animal, and especially deer lovers, I have good news for you! Many deer call Miyajima their home. The deer are mostly friendly and not dangerous, and you will see them everywhere! Miyajima is a mystic place and not your ordinary tourist trap. If you are in western Japan or a planning a trip to Japan, I would definitely recommend you put Miyajima on your itinerary! You get outstanding views and maybe even a new deer friend! This entry was posted in Places to visit in japan on May 10, 2016 by admin. Jigokokudani Monkey Park is a place that you are guaranteed to meet adorable, wild “snow” monkeys in Japan. The monkeys bathe in the hot spring year-round, which is a very memorable sight to see. There are several tens of monkeys that have formed their own groups and live within the park. It’s very interesting to watch their interactions with both the other monkeys and the people who come to see them. Jigokudani Monkey Park has become extremely popular in recent years with foreign visitors. It’s located off the beaten path but it well worth a visit. The Jigokudani Monkey Park is located in Marunouchi, a famous hot spring town. Admission to Jigokudani Monkey Park costs ¥500 for adults and ¥250 for children. A visit to the park makes for a great half or full-day side trip from the Nagano area. 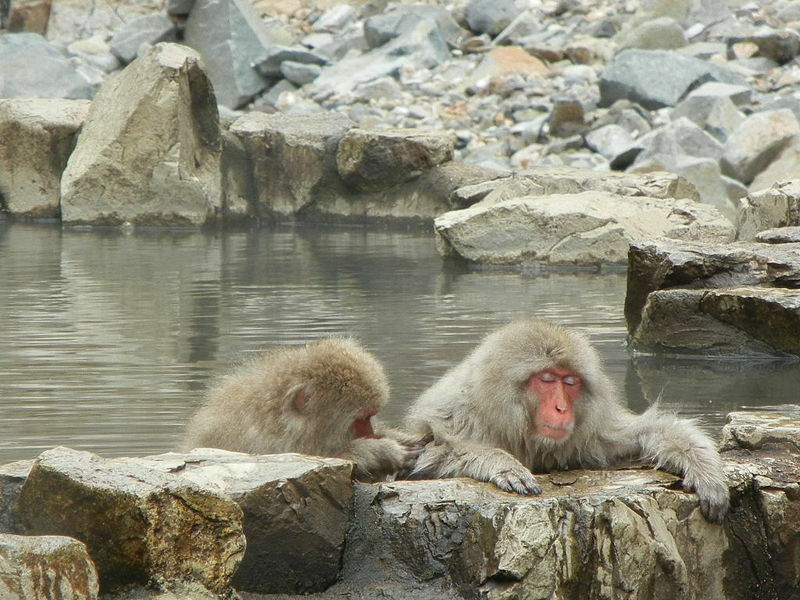 Another great thing about the Jigokudani Monkey Park is that it is located near many hot springs, or onsen. The hot springs aren’t only for the monkeys either – there are hot springs for people, too! 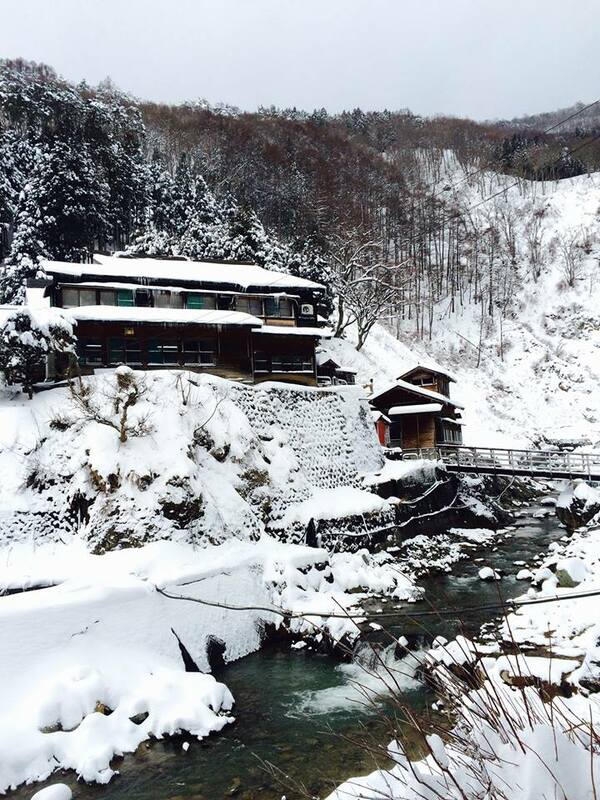 The most famous onsen in the area is the Yudanaka Onsen. The Shibu Onsen is popular as well. Why not take a hot bath in the onsen after the hike up to see the monkeys? There is also a lot of other wildlife in the park apart from the monkeys. Foxes, raccoons, badgers, and minks all call Jigokudani Monkey Park their home. A trip to the Jigokudani Monkey Park is sure to please all sorts of travelers. The park is located in a rural area of Japan that some may find a bit difficult to find. Please follow steps below to quickly find the Jigokudani Monkey Park. From Nagano Station (reachable via Shinkansen from Tokyo, Kyoto, Osaka, etc.) take the Nagano-Dentetsu line to Yudanaka Station (38 minutes by limited express train). From there, get on the bus to Kanbayashi Onsen for about 15 minutes. It’s about a 35-minute walk from the station. The path from the Kanbayashi Onsen to the Jigokudani Monkey Park is called the “Yumichi Nature Trail” and runs approximately 2 km. This road can be a bit slippery during the winter, so please be careful. You might even run into a monkey before you reach the onsens they bathe in! If you do meet one, please remember to not give the monkeys food. The scenery leading up to where the monkeys is also breathtaking – especially during the winter. There is a beautiful backdrop of snow covered trees and mountains. Just make sure to be careful of the strong winds! There are several employees who can speak English in the park. For more information, please see their official website (below). You will find general information on the park, detailed info about the monkeys, and adorable pictures to boot! This entry was posted in Places to visit in japan on May 3, 2016 by admin. In Japan, the season has now arrived in Japan for flower viewing (hanami). This typically means appreciating the cherry blossoms that are only in bloom for a couple of weeks out of the year. However, the word “hanami” can also be used with other types of flowers, for example, the plum (ume) flowers that bloom during the winter. 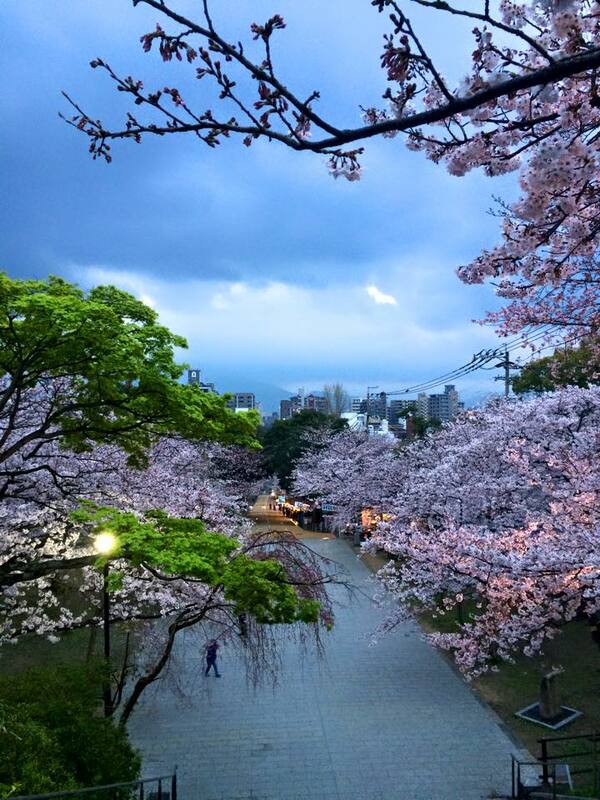 Hanami is a time to spend with enjoy yourself, others, and the scenery all at the same time. This entry was posted in Places to visit in japan on April 23, 2016 by admin. I would like to take this opportunity to write about Kumamoto Prefecture, a beautiful area on the southern island of Kyushu. Last week, Kumamoto suffered a 7.3 M earthquake and aftershocks still rock the area as of present. I pray for the safety of those in the Kumamoto/Oita area as well as their family and loved ones. Kumamoto is one of the lesser-visited places in Japan, but it is rather popular with native Japanese people. Many people are familiar with Kumamoto’s mascot, known as Kumamon. Kumamon is a cheery black bear and can be found all through out Japan. He is likely the most popular mascot in Japan. If you visit Kumamoto, you are sure to greated by a familiar smile – Kumamon’s! You might even be able to meet Kumamon himself if you’re lucky. 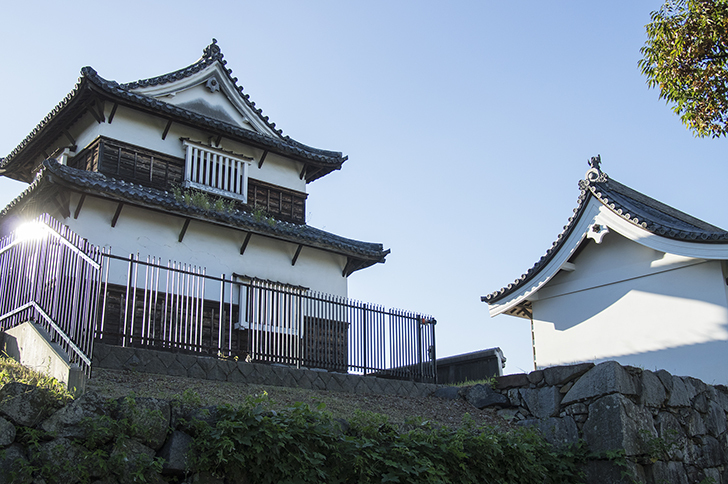 The most famous tourist attraction in Kumamoto Prefecture is Kumamoto Castle. 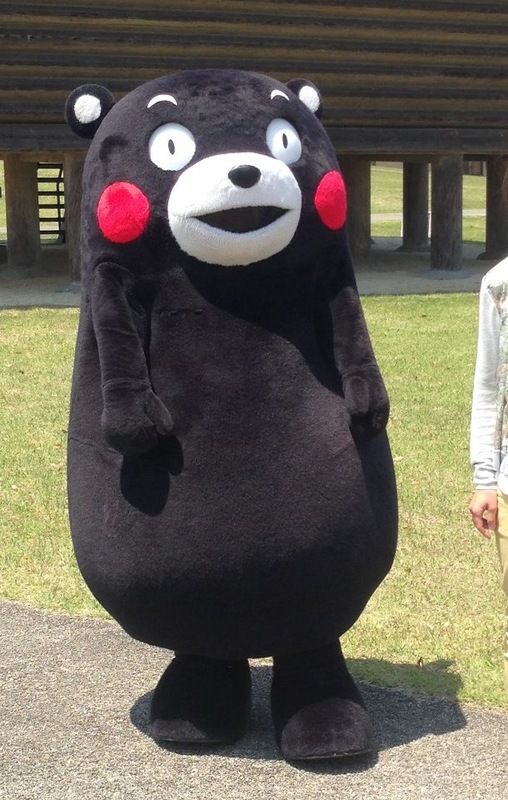 Similarly to Kumamon, it is a tall black castle with a great sense of presence. It is a peculiar castle that was built in the 15th century. 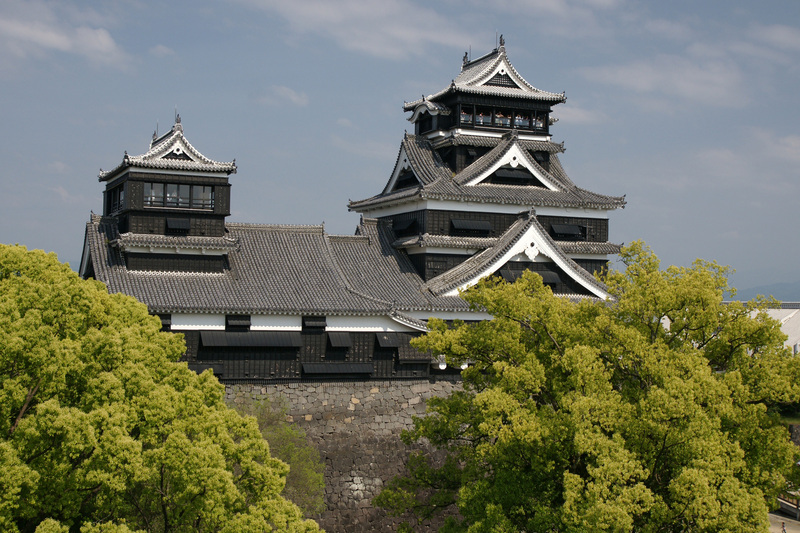 Kumamoto Castle is the third biggest castle in Japan, making it a must see for those interested in Japanese castles. After climbing up several flights of stairs, the view overlooking Kumamoto City is spectacular. As a bonus, you could also try to have a chat (in Edo-period Japanese!) with one of the samurai-dress men who stand outside the castle. Another place I would recommend is the Aso region, a bit south of Kumamoto City, the prefectural capital. Aso is home Mt. Aso, an active volcano. It is a very picturesque region and is also quite famous for its dairy farms. However, make sure to check before going to see if the area is safe (sometimes the volcano emits dangerous gases and is closed to tourists). There is a ropeway that goes up the volcano. As for food, the most famous dish in Kumamoto is called “basashi”, raw horse meat. “Basashi” specialty restaurants can be easily found in Kumamoto City and are recommended for more adventurous eaters. For those looking for a more tame dish, why not have a bowl of Kumamoto ramen? Kumamoto is easy to get to from Fukuoka City. From Hakata Station in Fukuoka, you can reach Kumamoto Station in approximately 45 minutes by the Shinkansen and about 2 1/2 hours by local trains. To get to Kumamoto from Tokyo, it’s probably most convenient to fly to Fukuoka first. There is a small airport just outside Kumamoto City as well, but flights are not as frequent. *Please note that some of the tourist attractions in Kumamoto Prefecture have been damaged in the 2016 earthquake, such as Kumamoto Castle. This entry was posted in Places to visit in japan on April 19, 2016 by admin. Dazaifu is a small city in Fukuoka, Prefecture. It is a relatively small, traditional city that is mostly known for its beautiful shrines and temples. It’s easily accessible from Fukuoka City in around 20 minutes by the Nishitestu train line. Dazaifu is an easy day trip (or even half a day) for those in Fukuoka, and it is a top destination in Kyushu for temple lovers. There is two shrines that I recommend tourists visit: Dazaifu Tenmangu and Kamado-jinja. Dazaifu Tenmangu (see photo) is the likely the most famous shrine in Fukuoka Prefecture and possibly in all of Kyushu. A good time to visit Dazaifu Tenmangu would be on New Year’s Day. Visiting a shrine on New Year’s Day is called hatsumode (“first visit”) in Japanese. It is customary in Japan to visit a shrine on New Year’s Day to receive good fortune for the coming year. 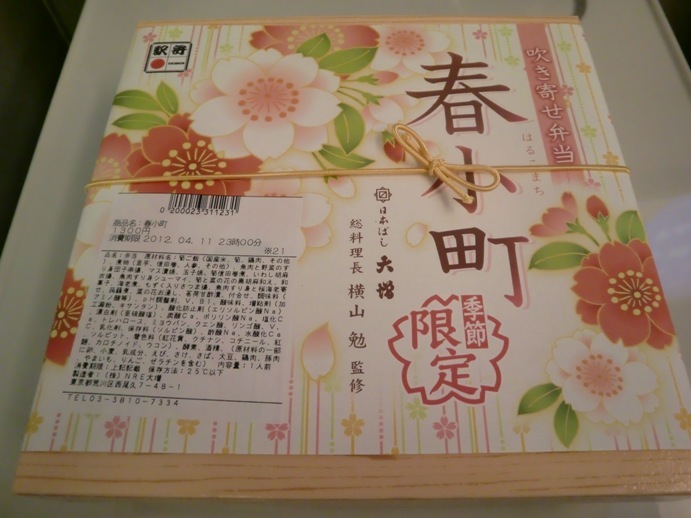 Many Japanese choose Dazaifu Tenmangu for their hatsumode. If you want to visit a Japanese shrine filled with Japanese visitors, Dazaifu on New Year’s Day would be the spot to do it. If you’re not in Japan around New Year’s, Dazaifu Tenmangu also has beautiful plum trees that bloom around late February and March. Japanese people also often visit Dazaifu during the Seven-Five-Three Festival (held in November) where they celebrate their children who are 3, 5, or 7 years old. 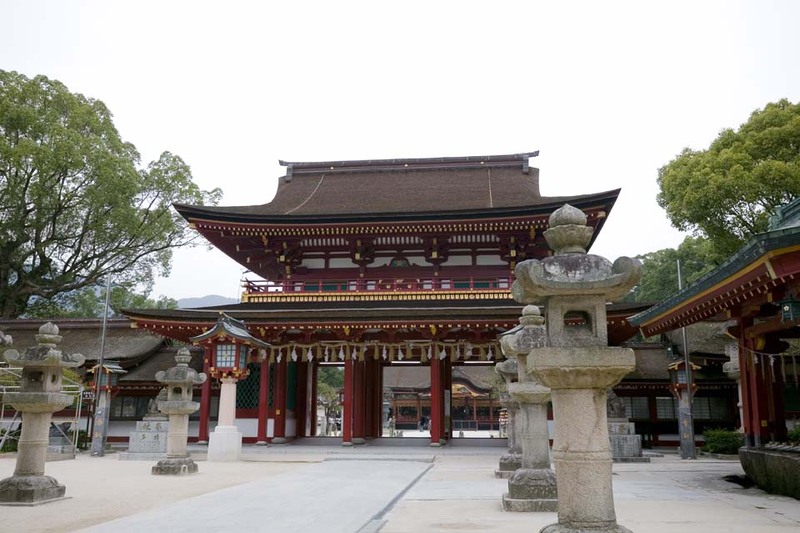 Lastly, Dazaifu is also known as a shrine that brings good luck to students and other educational pursuits, so Dazaifu would be a good shrine for those who are preparing for upcoming entrance exams. The next place I would like to recommend is Kamado-jinja. Kamado-jinja is a small Buddhist temple set back in the mountains of Dazaifu. It is in a very quaint, rural location and is a bit more difficult to get to, but it has plenty to offer. Kamado-jinja was especially famous this year for its beautiful autumn leaves (called “koyo” in Japanese). Dazaifu City in general is very beautiful in autumn, especially around Kamado-jinja. Once the leaves start to turn red then even light up the temple at night. Kamado-jinja is called an “en musubi” temple, meaning that it’s meant for lovers. For this reason it’s mostly popular with couples, but it’s beautiful enough to visit even alone or with friends. If you have a crush that you’re considering confessing to, Dazaifu just might give you some extra luck. I also have a recommendation for a side trip on the way back from Dazaifu. For those that want to try out a traditional Japanese onsen, I would highly recommend Futsukaichi. Futsukaichi is another small Japanese town, but it has tens of private-run onsens that are also very inexpensive. Many Japanese people like to visit multiple onsens in onsen towns because they each have their own unique qualities and benefits. This would be a great place to stop for travellers tired after a long day. This entry was posted in Places to visit in japan on April 16, 2016 by admin. Fukuoka is the largest city located on the southern main island of Kyushu. This is a destination that is sometimes forgotten by tourists, however this up-and-coming city was recently ranked as the 12th best city in the world (Monocle Magazine, 2012). Fukuoka is one of the fastest growing cities in Japan, in particular among young people. It boosts great food, beautiful scenery, convenient public transportation, and a glimpse a modern Japanese metropolis. Fukuoka used to be two separate cities, which is why there are two main downtown areas in Fukuoka: Tenjin and Hakata. Essentially, Tenjin is the main shopping and commercial area, while Hakata is known for its food at businesses. The two areas have a very different vibe to them, so it’s worth stopping by both! Close to Hakata Station is Canal City, which although may seem like an ordinary shopping/entertainment complex, is something not to pass by during your visit to Fukuoka. Canal City is made of a few different buildings all connected by beautiful yet modern canals. It’s a miniature Venice in Japan. At night, there are often concerts held on the bottom floor next to the flowing canals. Canal City has plenty to offer for both locals and tourists. Fukuoka has an outstanding reputation in Japan for its good eats. The most famous dish is tonkotsu ramen, which uses a broth made from pork tissue and bones. However, not to fear, it is much less exotic and much more tasty than it sounds. It’s Fukuoka’s standby dish, and Fukuoka is the city of ramen. 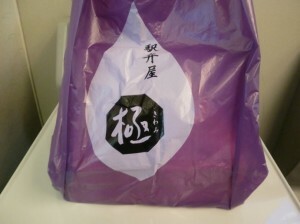 Another rather unique food famous in Fukuoka is called mentaiko. Mentaiko is pollack and cod eggs and has a distinctive spicy flavor, which is why it’s often used as a condiment in Fukuoka. While you’re in Fukuoka, you can find many of your favorite dishes with mentaiko added them, so why not add a little spice to your life and give mentaiko a try! For those who are interested in the nature size of Japan, Fukuoka won’t disappoint. Fukuoka hosts several parks including Ohori Park and Maizuru Park. 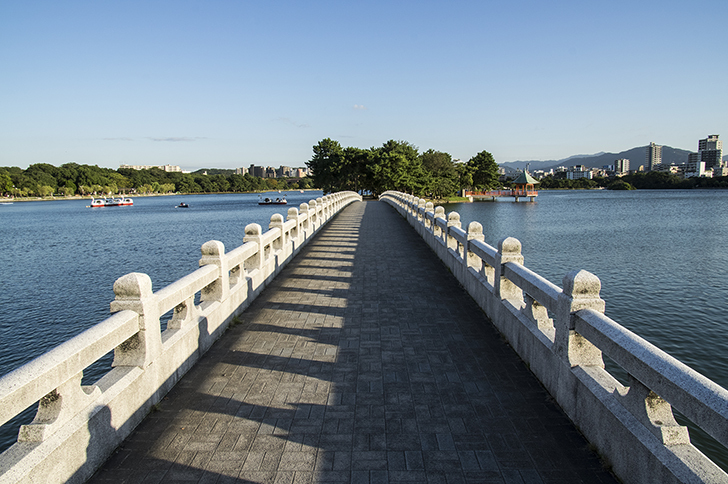 Ohori Park is set around a large pond, and has a modern Japanese feel to it. Right next to it is Maizuru Park, which where you can find the Fukuoka Castle ruins. There are rumors that Fukuoka Castle is going to be rebuilt in the future, however, for now you can still enjoy the climbing up to the top of the ruins and overlooking on the view of Fukuoka City. Fukuoka is a fast growing city with a contemporary vibe. 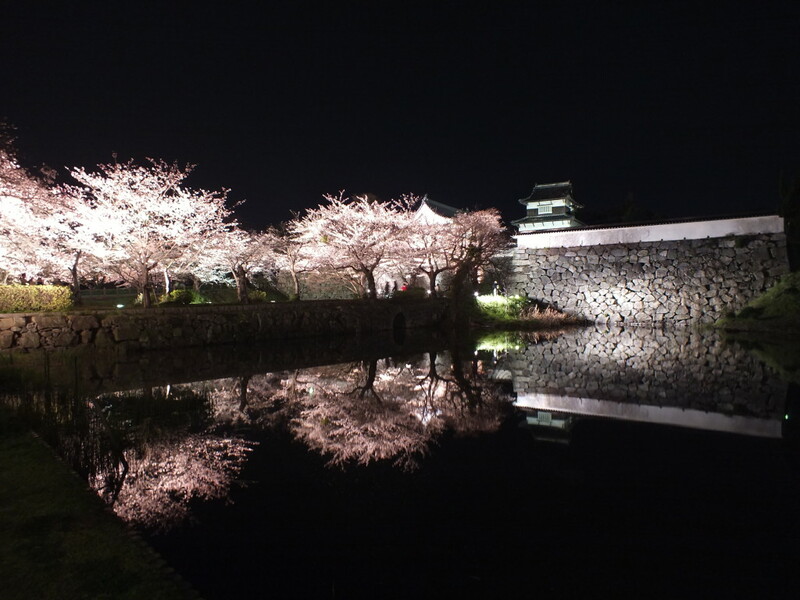 However, it also boosts a rich history and tradition that one will find when exploring Fukuoka. It has a very strong Kyushu based identity, which sets it apart from many of the other major Japanese cities. As of 2011, the Kyushu Shinkansen has started making travel to this less travelled part of Japan even more enticing. This entry was posted in Places to visit in japan on April 9, 2016 by admin. 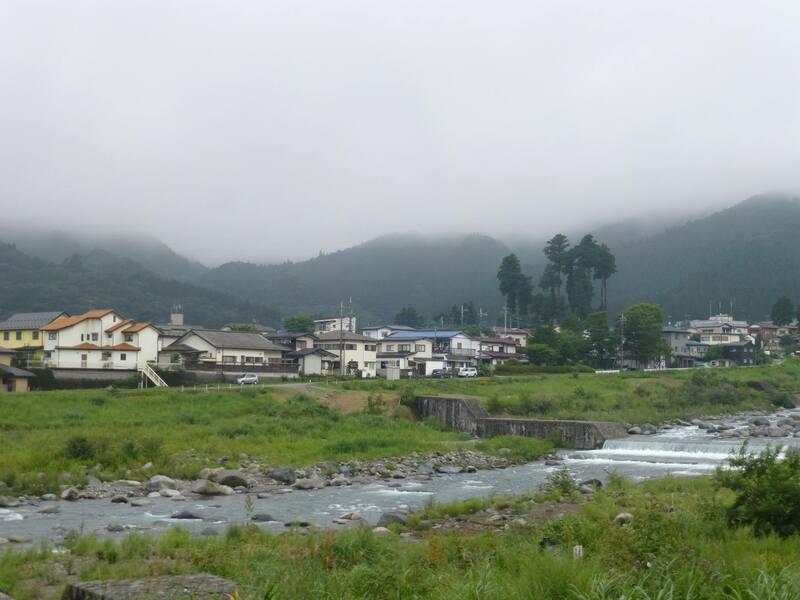 The pictures don’t lie: the Japanese countryside is breathtakingly beautiful. You can scope out the rolling rice fields, take a stroll through a vivid green bamboo forest, or even hike up an unsuspecting mountain. For those with a curious and more adventurous side, the countryside will not disappoint. It doesn’t matter where you go. You could simply take the next train going to a station you don’t recognize. 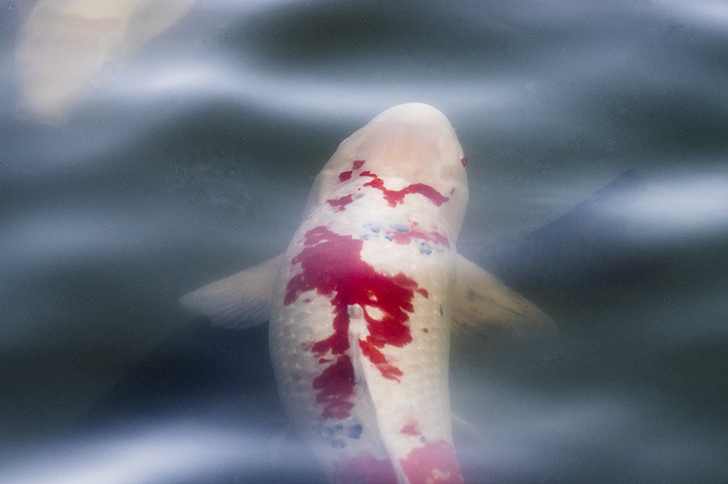 Once you get out of the urban sprawl of the city, Japan’s natural beauty is awaiting you. The countryside is ideal for practicing your Japanese. While most urban areas in Japan are becoming more and more English friendly, if you manage to get far enough off the grid, there are still places in Japan without bilingual Japanese-English signs. This also means that there will be less people who are proficient in English (though this is slowly changing). In any case, most people living in rural Japan will be more than willing to speak Japanese with you, so why not give it a try? Japan is known for its cuisine and even more so its local cuisine. Even smaller cities in Japan will usually have their own specialty or two, which means making a stop to the Japanese countryside will be worth your while. For instance, interested in trying the formidable fugu (puffer fish)? Well, Shimonoseki in southern Yamaguchi would be the place to go. You’ll find several different places you can eat fugu there, and you can rest assured knowing that it’ll be some of the tastiest fugu in Japan. Although Tokyo is perhaps a symbol of Japan, there is a lot of Japan to see outside of Tokyo and the surrounding sleeper towns. Tokyo is a remarkable city and is worth checking out, however, one must remember that Tokyo was not the capital until somewhat recently (historically). The majority of Japanese do not live in the Tokyo area, and many have pride in their hometowns. If you’re looking for a more laid-back, traditional Japanese cultural experience, I would recommend venturing out into the Japanese countryside. The Japanese countryside is riddled with little treasures. Even if the middle of a rice field you may very well find a lone vending machine. The countryside also has a lot of small shrines and temples that you can enjoy without the crowds. There are a ton of places to explore and little pieces of adventure along the way. While Tokyo, Kyoto, Osaka and other major Japanese cities often top the lists of tourists in Japan, there is a lot of undiscovered beauty and fun in the Japanese countryside. Which small town in the countryside to visit is up to you, but when coming to Japan, why not take a short break from the hustle of the city and try out the unexplored region of Japan. This entry was posted in Places to visit in japan on April 1, 2016 by admin. Tokyo Station was restore to its original last month. The building was build in Taisho Period (1912 – 1926 ). Enjoy Tokyo station’s new and old! This entry was posted in Places to visit in japan on November 2, 2012 by admin. Do you know what SKY TREE is? If not, you’ve got to know!!! Tokyo SKY TREE is a new tower built in Japan. The height is 634m, the highest in JAPAN! how beautiful it would be when you look down from 634m! Also, the height, 634m has a meaning too. You can read “634 = Mu Sa Shi”. Musashi is a old name for the area of Tokyo, Saitama, Kanagawa prefecture. why don’t you try SKY TREE? This entry was posted in Places to visit in japan on October 23, 2012 by admin. Shinkansen(新幹線）,Japanese TGV, simply saying…very very fast train is a comfortable and fast way to travel around Japan. Yes, it is comfortable, it is fun just by riding it, but many Japanese buy “Eki-ben” and enjoy more. Do you know what “Eki-ben” is? “Eki” means “station” in Japanese. “Ben” is abbreviation of “Bento”. 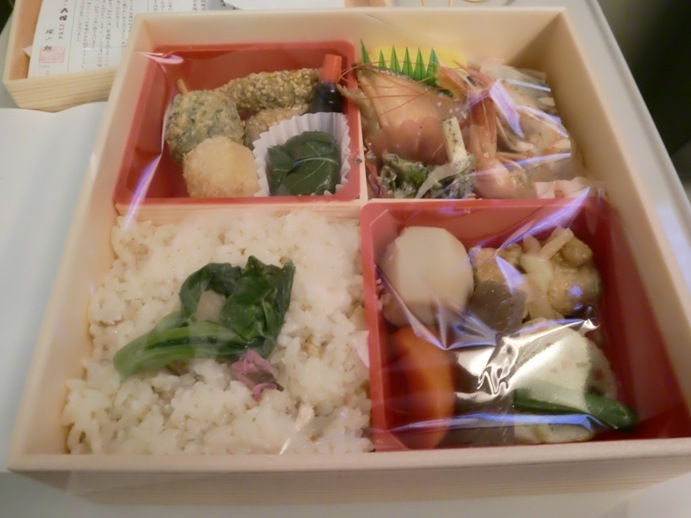 So, it means that a Bento of a station. All around Japan, there are many different kinds of food specialty of its place. 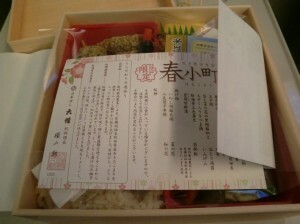 They make bento with these food. Japanese buy the “Eki-ben” and enjoy the ride eating “Eki-ben” and sometimes with a beer! This entry was posted in Places to visit in japan on June 15, 2012 by admin.